DENVER, CO--(Marketwire - October 1, 2010) - It's lights, camera action at the Fairfield Inn and Suites Denver Cherry Creek. For a limited time, people can go on a Denver weekend getaway and experience the star treatment when they book the Hollywood Boulevard package at this hotel. This package is perfect for movie buffs, as well as those who just want to escape for a couple of hours when they're on vacation. The Hollywood Boulevard Package includes two free movie tickets. Additional tickets are available for $10 each. Travelers can go to http://hollywoodmoviemoney.com/ and find participating theaters, as well as available movies and trailers. Guests also receive a deluxe guestroom and standard amenities when they book the Hollywood Boulevard Package. Standard amenities include complimentary breakfast, free internet, cable TV, use of the picnic/barbeque area and more. Each of the amenities was designed to provide guests with the best in comfort and style so they can have an enjoyable stay at the Fairfield Inn and Suites Denver Cherry Creek. Some guests will want to continue to receive the star treatment after the movie is over. Those who want to continue to live it up can take in some activities located near the Fairfield Inn and Suites Denver Cherry Creek. For instance, the hotel is a mere tenth of a mile away from a full service spa. Theater goers can stop by the spa to get the real Hollywood treatment after they watch their film. Whether they want a wax, massage or facial, they will be able to get it at the spa. Others may want to continue living the high life out on the golf course. With two golf courses, within miles from the hotel, it is a great opportunity to get some exercise after watching a movie. Rates for the Hollywood Boulevard package are from $99.95 to $119.95. The offer is valid until October 2, 2010. Promotional code ZJL must appear in the Corporate/Promotional Code Box when ordering online. 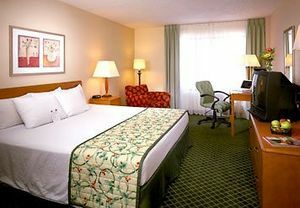 For more information, visit http://www.marriott.com/hotels/hotel-deals/denfi-fairfield-inn-and-suites-denver-cherry-creek/ or call 1-303-691-2223. The Fairfield Inn and Suites Denver Cherry Creek makes traveling easy for all types of guests. Business guests benefit from the business services available at the hotel. Pleasure travelers enjoy the pay-per-view movies and swimming pool, and all travelers love the spectacular mountain and city view guestrooms. No matter the reason people are traveling, they find the Fairfield Inn and Suites Denver Cherry Creek stands above the other hotels near the Cherry Creek Mall in Denver. The beautiful Denver sunset plays with our newly designed exterior.